Famous Impersonator Rich Little, has created a collection of charcoal portraits of celebrity icons. He is now making limited edition giclee prints of these portraits available for purchase at his website. The prints available include portraits of Ronald Reagan, George Burns, Meryl Streep, Frank Sinatra, Brad Pitt & Angelina Jolie, Johnny Carson, Sean Connery, and many others. 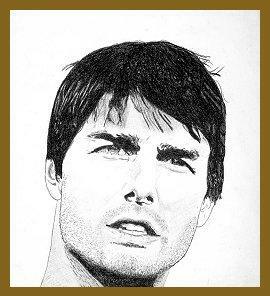 The image posted here is Tom Cruise by Rich Little. He will be presenting his drawing of President Bush and First Lady Laura Bush to them personally on April 21, 2007 at the White House Correspondent Association Dinner in Washington D.C.
For more information see the Official Rich Little website. Rich Little is listed on page 2 of the Pop Life Art Celebrity Artists List.